Amid growing concerns surrounding global food security Graeme Calder of P3 Permaculture explains that contrary to popular belief "we live in a hopeful time." While the industrial model of agriculture remains the dominant method of global food production, alternative methods such as permaculture have become increasingly popular areas of study. "Permaculture is a design science whereby we observe nature, we look at patterns that nature uses for fertility, or irrigation, or whatever it is you need to do in your design and then we design systems with that," says Calder. By observing nature and creating naturally abundant self-sustained systems permaculture eliminates the highly controversial chemical dependency of the industrial model. Contemporary techniques such as planting monoculture, deforestation, and the use of chemicals lead to long term soil degradation. Farmers often harvest cash crops such as grains, corn, or soy to reap the economic benefits unaware of the long term impacts of such practices. "The major challenges to small scale agriculture are access to land and access to alternative methods to agriculture. What we understand as an option for agriculture is the industrial model, the chemical model, and there are dozens of other models of agriculture which have proven themselves successful" says Calder. 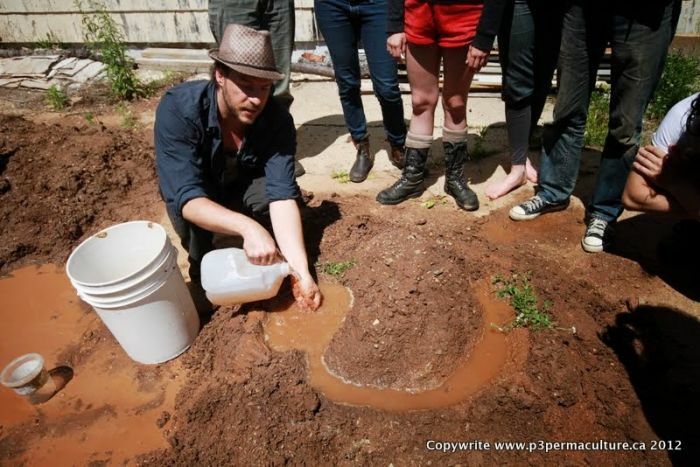 One area where permaculture has exceeded conventional practices is in top soil restoration. By using what is known as a keyline plow which cuts deep into the soil to allow water and nutrients to be more easily absorbed topsoil can be regenerated within a matter of years opposed to the hundreds of years it takes to regenerate topsoil using contemporary methods of agriculture. Proponents of keyline plowing claim that up to 18 inches of topsoil can be generated within just 2 years using this technique. This is an example of observing nature to provide the soil with the right conditions to grow food. There are a number of workshops and certification courses offered by P3 Permaculture for those interested in learning how to grow their own organic food. The workshops and certification courses offer hands on experience in growing food and the techniques used in permaculture. Calder uses the analogy of a dandelion to illustrate his philosophy on P3 Permaculture noting that "a dandelion will grow in a green grass lawn that's compacted has no copper, has no iron, and no calcium. It accumulates copper, it accumulates iron, and it accumulates calcium in the soil while de-compacting it." "So essentially a dandelion is actually working itself out of a job. If you let it, 25 years down the road it might have accumulated enough copper, and iron, and calcium, and de-compacted the soil enough that it doesn't like those growing conditions so it leaves. The seeds move on, it's done its repair in its natural ecosystem," says Calder. Calder explains that his efforts in the permaculture business are similar to that of the dandelion which is why he has no qualms about giving away secrets of the trade and providing an abundance of information to those interested. He feels the quicker he educates people on how to grow their own food the quicker he can move on to larger scale projects. While Calder still provides design consultations and workshops on permaculture Calder has also branched out into park design working on the Legacy Park in Chester Basin, NS. The initial idea for the park was to focus on christmas tree production, gold mining, and barrel making. "I said first and foremost if you're going to talk about the gold and the trees you need to talk about how they were fed. How did they live in such a way that they could spend time digging into the earth to extract gold. That's a pretty big feat for any form of civilization, to start mining gold. So the food is important" says Calder. The Legacy Park has expanded to include a homestead site which displays local food and a site of traditional Mi'kmaq medicines which allowed early settlers to survive in Nova Scotia. The park is not yet open to the public as it is still in the first phase of construction, however, there are workshops hosted at the park to teach people how to grow traditional foods and add to the site. Calder also hopes to integrate urban design workshops into P3 Permaculture to teach people how to grow with limited space in the city. "We could produce a large portion of our food in our cities if the parks were edible, the shrubs were edible, if we had more habitats for food and pollinators in the city, then cities would be hubs of activity" says Calder. Calder states the best tip for people wanting to get involved is to "connect with people so that when you discover something that works you can share it with them."